A Pontifical is a liturgical book containing texts specifically to be used by a pope, archbishop, or bishop, such as for the consecration of bishops and of churches, the coronation of a king; various blessings, for a bell and a new well, for example; and many others. A flyleaf note records that the manuscript had belonged in the Middle Ages to Evesham Abbey, in Worcestershire. 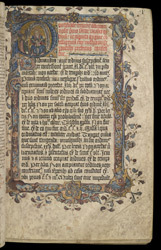 The first page of the main text has an initial 'P' containing a bishop kneeling before the Trinity. The quality of the illumination is not especially high, suggesting that it was done in a provincial centre, perhaps somewhere like Worcester, or Evesham itself.